Standing (left to right): Kaleigh Mena, Ethan Rowe, Christian Whitehouse, Nicole Brumm, Jeb Green, Stephen Paske, Jacob Johnson, Alanna Anderson, Kenny Kress, and Laura Lindberg Kneeling: Ben Wicker, Seth Pohlman and Gwen Smith. Kaukauna School District photo. the Juvenile Diabetes Research Foundation. The money was raised in just one week by the students as part of an enrichment activity. Laura Lindberg, a teacher at River View, works with the Eagle Academy students during their PIE time (Practice, Intervention, Enrichment), in an enrichment unit studying character education, focusing on respect, responsibility, productivity and touching on the character traits of empathy, gratitude, tolerance and sacrifice. During the “sacrifice” unit, students were tasked with leading a community service project. They chose to collaborate with JDRF, the Juvenile Diabetes Research Foundation, to collect and donate money to help fund further T1D research. 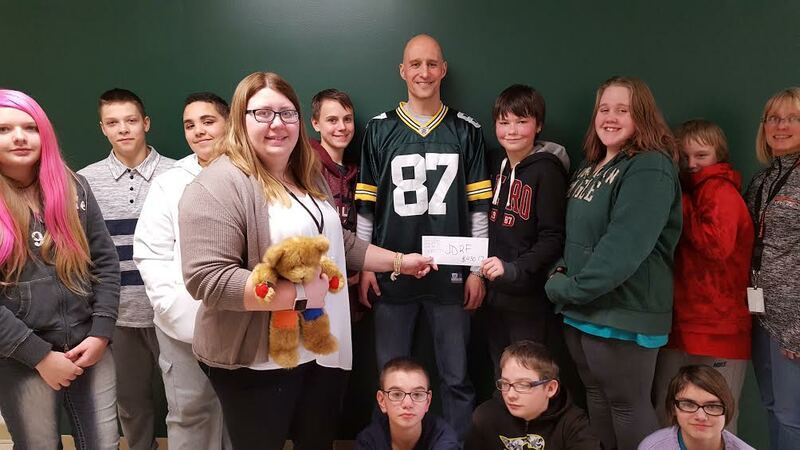 To help drive donations, River View Associate Principal (and Minnesota Viking fan) Stephen Paske agreed to wear a Packer shirt on Friday, Feb. 3, 2017, if students were able to raise $100. Eagle Academy students worked throughout the week to promote the fundraising event and collected $430.17, which was presented to Nicole Brumm from JDRF on the morning of February 3. Brumm thanked the students for their work, and explained that the donation will be used to change lives through ongoing research. Paske also fulfilled his promise, donning a Jordy Nelson jersey for the day.